Have you ever dream to play with SpongeBob? Well, here he is! Just use the arrow keys and try to avoid any obstacle. Be sure that you can cope with it and just be really attentive here. Is everything clear? Then play with your best characters. Have fun. Are you strong enough? Then choose the game and you will be not disappointed. 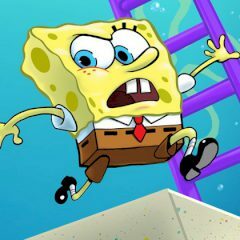 So, here you are going to play as SpongeBon and dodge jellyfish and deadly bubbles in each area. As you advance, large cartoon characters will block your view. Just do everything to reach the finish in the fewest amount of fails and have so much fun here! We will show you how to do it right and thus, use your chance and just do everything to become the real winner of the game. Enjoy it right now and set the best record. SpongeBob is waiting for you!